The front door helps create a first impression of the home. The color of the entryway the materials, the size, the simplicity or extravagance of the entrance all lend itself to the ambiance of the property. For those who are designing a new home or looking to remodel or refresh the exterior of a current home, consider changing the door to something that reflects personality instead of functionality. 1. Consider privacy. From wood to glass, homeowners get to choose the level of privacy they want with their choice of materials for the front door. 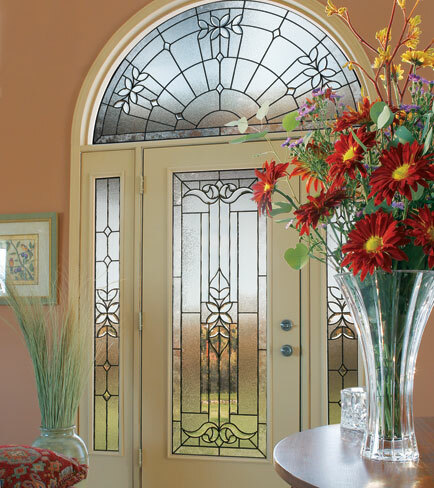 However, even glass can offer privacy by using frosted glass or stained glass designs. For those on a budget, places like Home Depot offer great stick on ‘stained glass’ options that prevent people from looking in but still allow light to filter through. Homes that are set off the street and have a gated home may feel more comfortable with glass doors, as they are easy to break into. 2. Level of security. Doors come in all types of materials from wood to steel, fiberglass to aluminum. Glass, as previously mentioned, can be broken into fairly easily. Wood doors are sturdier but an ax can go right through. For high security properties, insulated aluminum or steel may be better options. Security systems can prevent break-ins and allow a feeling of security with less secure types of doors. Video cameras above the door are a good option for those wanting to see who is knocking before they open the door. 3. If you are replacing a door and the home is an older home, buy both the door and frame. Wood doors and frames are the most common, however they can warp or rot over time. Shifting of the house’s foundation can cause the frame to become crooked or askew. Trying to fit a new door into an old frame can necessitate sanding down the door. Buying a new frame helps ensure the door will hang properly and there won’t be cracks around the door where air leaks can occur. 4. Open in or open out? Public buildings are required to have doors that open out in case of an emergency where people flock to the exits. Trying to open doors in a mob scene can be close to impossible. The hinges on the door sit on the side that the door opens. For example if the door opens outward, the hinges would be on the outside. For residential buildings this can be a safety concern. Anyone cold easily unhinge the door. Having hinges on the interior of the door allows the doors to open inward and prevent security issues. 5. Personality. Choose a color door that represents the personality of the home. Doors can be handcrafted with intricate designs. Aesthetically speaking, churches tend to have some of the most ornate doors. Materials such as bronze, steel and wood can come alive with handcrafted designs. Wood can be carved into a tree interspersed with glass leaves or glass background. Iron hinges can be made into part of the design across the front door. Doorknockers are an inexpensive way to add style to a door. For untraditional ideas, consider custom woodwork or ironwork to make the door unique. A new coat of paint can make an old door look new. A bright color against a neutral home can help it stand out. From antique to modern, the front door of a house creates a mood and an ambiance that should translate to the interior of the home.